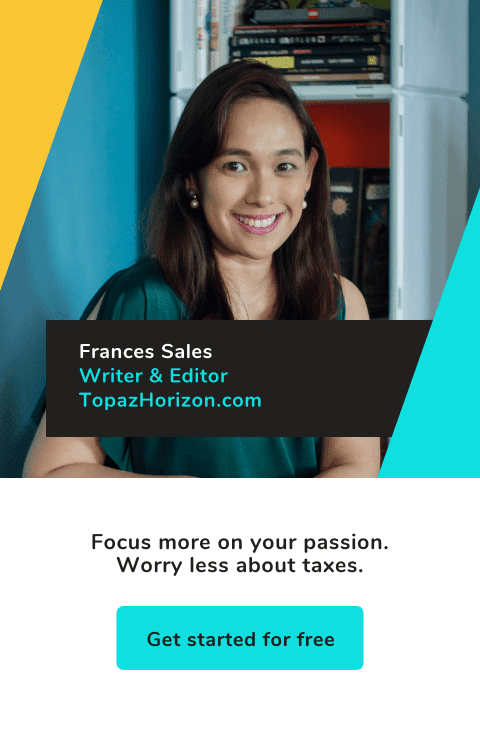 The former format of Topaz Fashion isn't going to work anymore. Since I gave away two-thirds of my wardrobe, I have nothing but a few blacks and grays hanging in my closet! My friend, Nicole, told me yesterday, "Frances, it's time to shop." Haha. Anyway, I figured that I'll still post a few outfits now and then but I'll make Topaz Fashion all about, well, fashion! Like clothes and accessories I found or want, stylish stars, fashion press releases of my friends, online shops, and the like. For this Friday, I'll tell you all about my shopping experience at Zalora. As you all know, I love shopping online. It's convenient. Most of the time, it's cheaper. Plus, you discover a ton of goodies that are hard to find in a mall. Anyway, I've already bought stuff from Zalora before but I bought cases for my Blackberry and iPad. A few weeks ago, I tried shopping for clothes. Now, I've been lusting after the floral print recently. So naturally I bought floral print pants from Zalora. 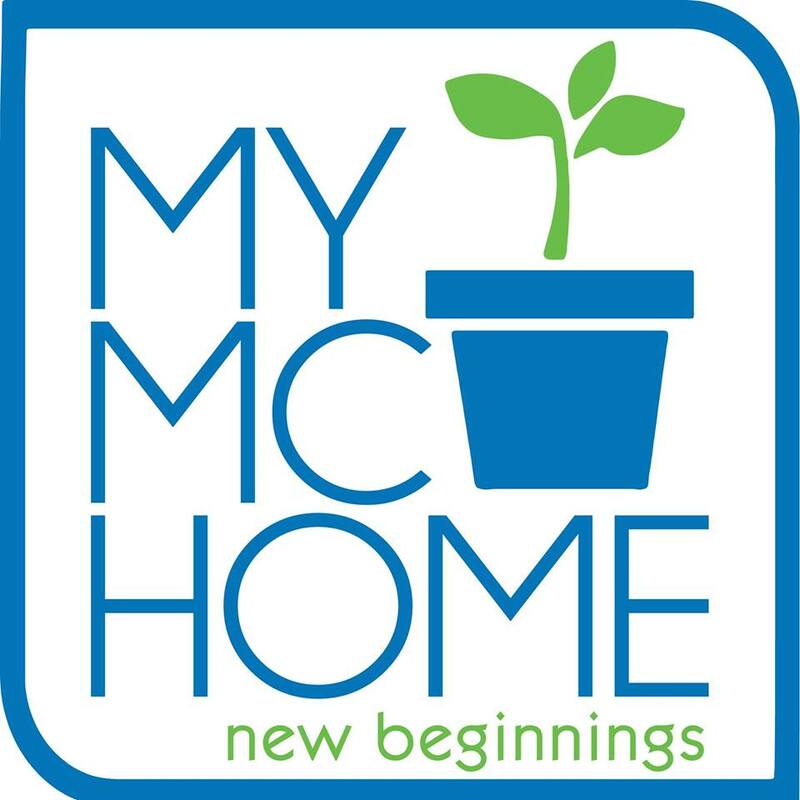 Easy to shop, easy to pay, quick delivery! Items arrived in a special package. 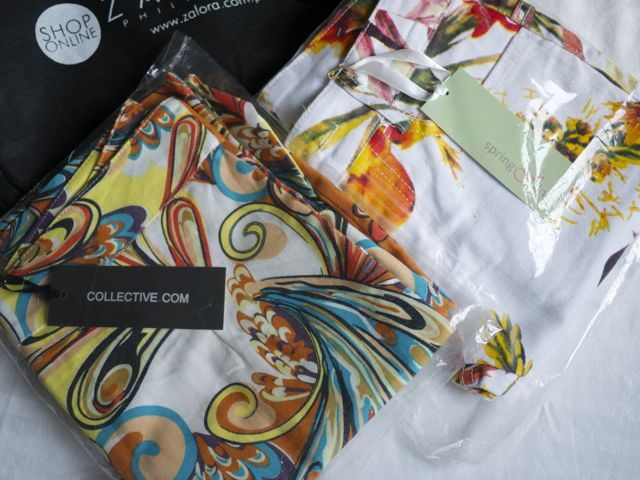 My pretty pants fromCollective.com and Spring Fling. So cute! Both for just P2,207.50. So cheap! My big problem with my pants is this: They're tiny! Hmm. I'm pretty sure I didn't make a mistake because I followed Zalora's size guide. 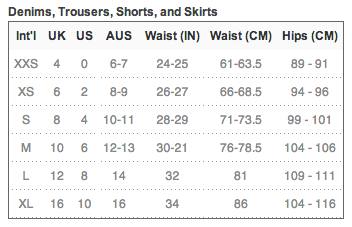 I went to Zalora's size guide, measured away, and was surprised when I saw that I was a small. My mommy body is medium now. Sometimes even a large (so I eat too much sometimes!). I knooooow. I'm skinny, yes, but I have a belly and birthing hips now. But look at the chart—the waist of the small is 28-29 inches, which is my current waist (sigh, I used to have a 22-inch waist). So... even though I had misgivings, I ordered the small sizes. So when the pants arrived and—sadness galore!—they won't even go past my knees!!! I returned the items last week of February. So easy! All I did was send an email to customer service to say I wanted to return the pants. 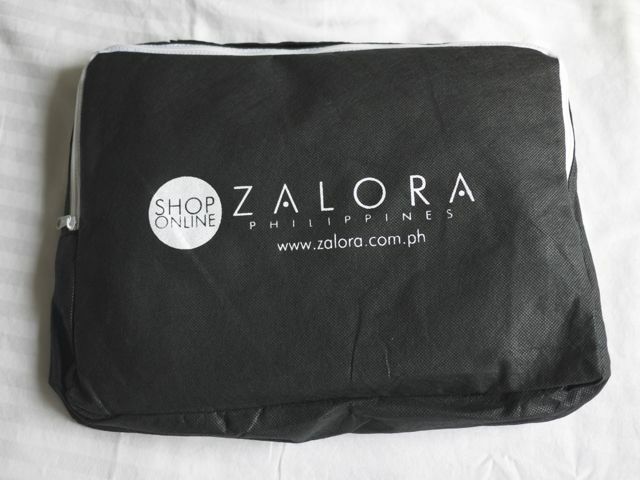 Then Zalora sent a messenger to my house to pick up the stuff. Ya! So convenient! About 15 days later, customer service said there's no large sizes anymore but I have store credit. So I guess I'm shopping again soon! I think I'll buy dresses next. P.S. 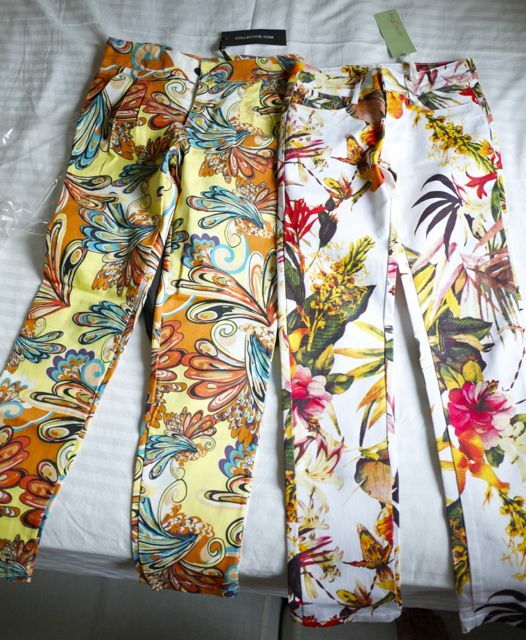 This Glamour story just made me want floral pants even more!!! hi! baka hindi meant ang floral pants? baka floral dress or top umubra. sayang noh? they're so pretty pa naman..
Mukhang hindi nga. Ayaw talaga sa akin! This post made me spend 4k plus in Zalora! And it's my first time to shop online. Yay! Must resist next time. Good luck to me! Huwaaaat?! I should ask Zalora for a code so my readers get discounts!!! Yeah, that would be great! Btw, they arrived and they were great except for some which are too big for me. I expected it though coz you can never shop perfectly online. Aunyway, thanks for this discovery. I like reading your blog coz you only endorse what you believe in unlike others. Ugh! I absolutely love this outfit! Those trousers are amazing! Definitely going to buy them.